For some time I have had a fascination for transitional planes. Since I have made two planes that are mainly made from metal it seems fitting that I should now make a transitional plane. The designs that have had the greatest influence on me are John Gage’s planes, but of course I feel the need to upgrade on the metal working side. I like the lightweight and low profiles of these planes and believe they could find favour with quite a few people. I also have some interest in ECE Primus planes but again I don’t like their metal work. I do, however, like the laminated sole very much. I feel I could improve here by dovetailing the hardwood sole instead of grooving. It will be technically superior as the mechanics of this jointing system is not totally dependent on glue. There are some problems in the making of this dovetailed system but I have overcome them with a considerable amount of thought and work. I will be very dependent on the use of my CNC machine. It could provide quite a challenge for the home constructor. As you may have noticed from a previous post I have already jointed and glued the bodies and they have been settling in my workshop for the past three months. 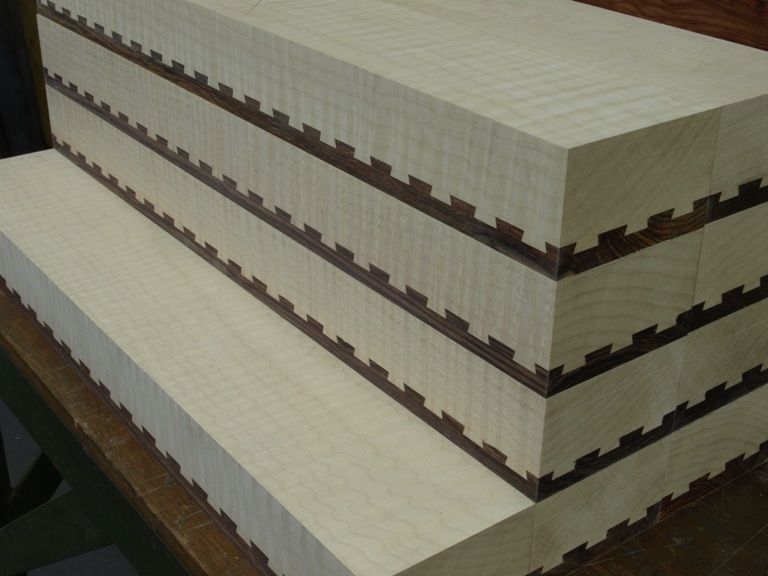 The timber that I am using is Quilted Maple, for its beautiful figure and light weight. I have a choice of two different woods for the sole; one is a Cocobolo rosewood (Dalbergia retusa) for its density and oiliness, or the Guatemalan Rosewood (Dalbergia cubiquitzensis) which is also dense and oily. Though I have had considerable interest in these planes I am not taking orders until I can price them. The picture shows the plane body being flushed using a face cutter in the milling machine. 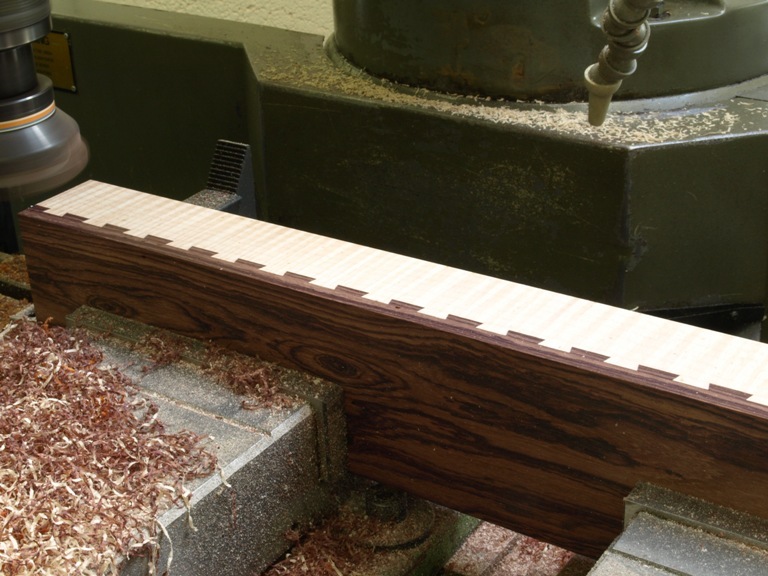 This is not just the only practical way of planing this very difficult wood because of the character of its grain, but I am also applying a high degree of precision. 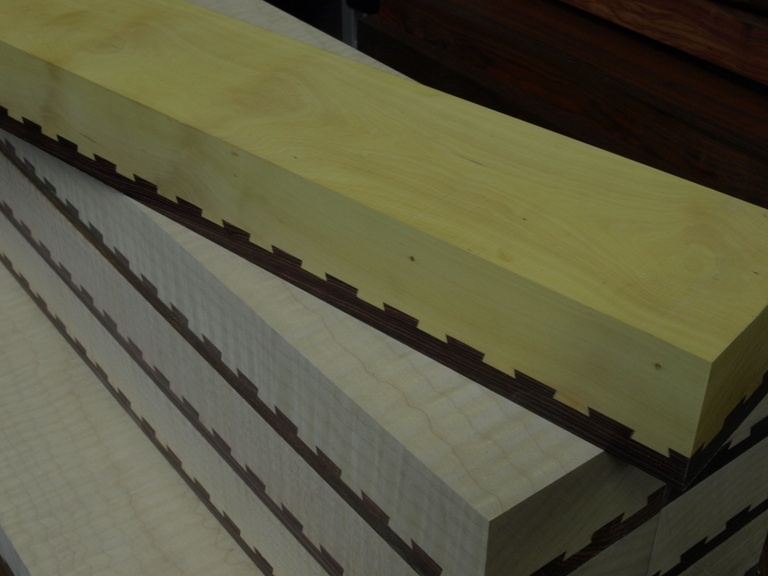 I am going to be making nine in rosewood/quilted maple and one all in cocobolo and one in rosewood/boxwood.